Today, October 2, is CX Day. It’s actually the 6th annual celebration of customers – the group without whom none of us would have jobs. Think about it. We have always had a day of celebration for employees…secretaries…bosses…you name it. But only recently have we had a Customer Experience, or CX Day. You could argue that delivering great customer service must be, and is, an everyday thing. But consider this: a Bain & Company survey of 362 CEOs and their customers showed that, while 80% of the CEOs believed their companies delivered superior customer service, only 8% of their customers agreed. Researchers posit that, once customers come on board, businesses begin to take them for granted. The focus, particularly in the C-suite, becomes less about delivering on the promise of a great customer experience and more about delivering more margin, greater revenue per customer and a better quarterly EBITDA. In short, businesses lose touch with the reason customers chose them in the first place. The research suggests that businesses lose focus on the customer experience because of the pressure to grow revenues and improve financial performance. That these things somehow distract from customer service. But what if businesses were completely missing the mark on what really propels growth? What if a rabid focus on the customer is actually the primary means to incremental sales and profit? Witness Jeff Bezos, who for many years fended off tidal waves of criticism about poor financial returns as Amazon stubbornly pursued its vision to reinvent retailing as we know it. Last I checked, they’re doing pretty well. The folks at HubSpot, following Bezos’ lead, certainly believe that customers are the critical core of a profitable growth strategy. 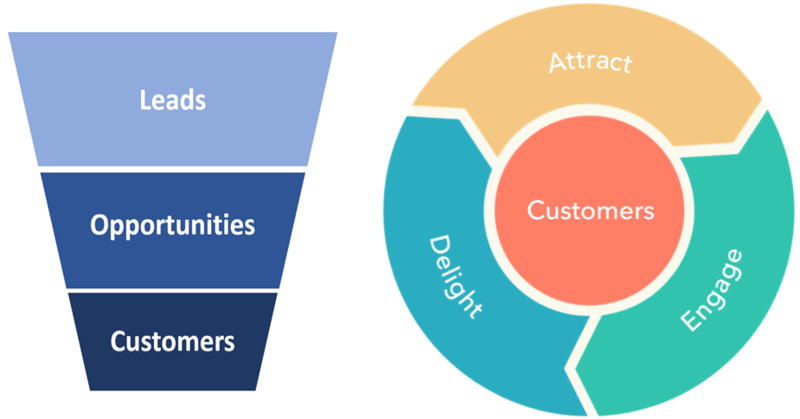 They actually call this new way of looking at growth the “flywheel effect.” In fact they suggest that, as a framework for looking at new customer acquisition, the traditional sales funnel model should be replaced by a new flywheel model. If you look at the two diagrams above, it’s clear that, in the traditional funnel graphic on the left, customers are at the bottom – last in the sequence of growth activities. But in the flywheel diagram on the right, customers are at the center. Back to Amazon. They never invested in a lot of advertising to find new business. People experienced buying on the site. It was fast and easy. They went back and bought more, then told their friends. The theory of the flywheel effect is that, by focusing on delivering a great experience to existing customers, that businesses create all the growth momentum they need. I’m no mechanical engineer, but I do know that the faster a flywheel spins, the more energy it transfers to the things around it. In sales, those things are delighting existing customers, and attracting and engaging new customers. More energy at the core naturally creates more energy with connected activities. In our own way, KANE has been pursuing a similar strategy for years. We’ve made Net Promoter Score (NPS) our core corporate metric. We measure hundreds of other financial and operational metrics, but NPS is the hub around which the other metrics revolve. Over the past several years, we’ve raised our NPS score an average of 46% yearly. It’s what happens when there is a concerted, organization-wide focus and commitment. We’ve even begun describing our approach to logistics management in terms of the customer – YOUgistics. Today is Customer Experience Day. A reminder to show our appreciation to the people and companies who matter most to our organization. In logistics, customers obviously have choices about which providers to work with. That’s why we need to re-earn their trust every day by delivering a great customer experience. But, we shouldn’t need a yearly celebration to remind us that delivering great customer service matters. Actually, it should serve as a reminder that it’s the ONLY thing that matters.